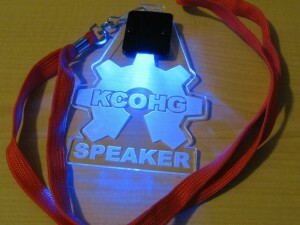 Two weeks ago I had the privileged to speak at the inaugural Kansas City Open Hardware Group (kcohg.org) Conference. The event was set up and hosted by CCCKC (c3kc.org) and the Kauffman Foundation (kauffman.org). I made up some glow badges for the event (seen above) and, in the spirit of the event, released them under CC over at our Thingiverse page. Head over there to get the design files as well as the details of the components and assembly! This entry was posted on Saturday, September 21st, 2013 at 8:32 pm and is filed under Uncategorized. You can follow any responses to this entry through the RSS 2.0 feed. You can leave a response, or trackback from your own site.